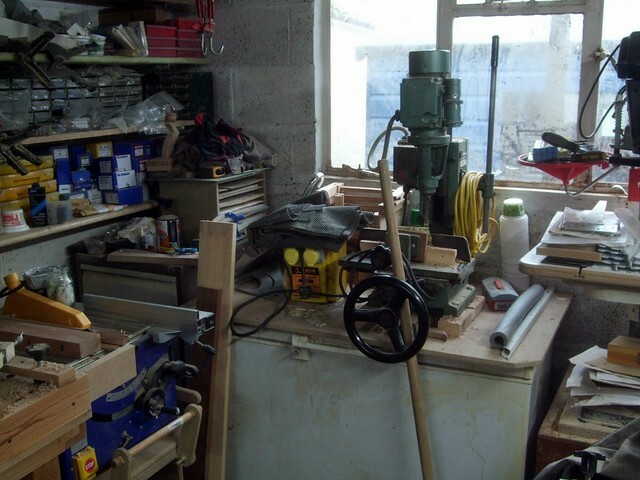 I came up with an idea to build a table-like frame and structure that would allow me to keep all my tools in the same place but, it wouldn’t bear any load on or obstruction to the freezer, meaning that it could be rolled out with ease and accessed when require. 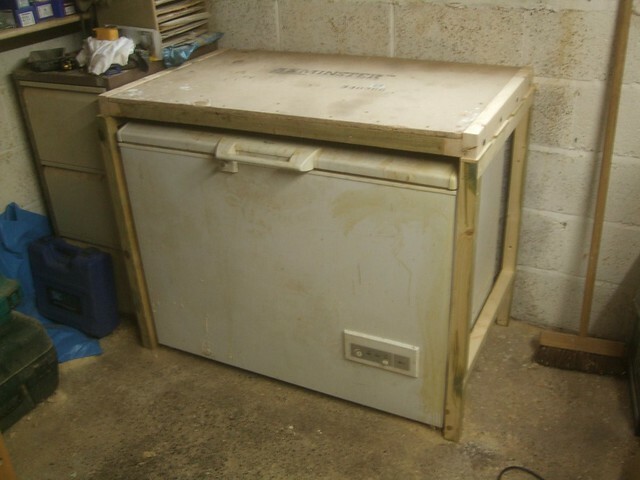 Essentially, it’s a ‘workbench’, which a big freezer living underneath. Construction for this one is fairly simple. 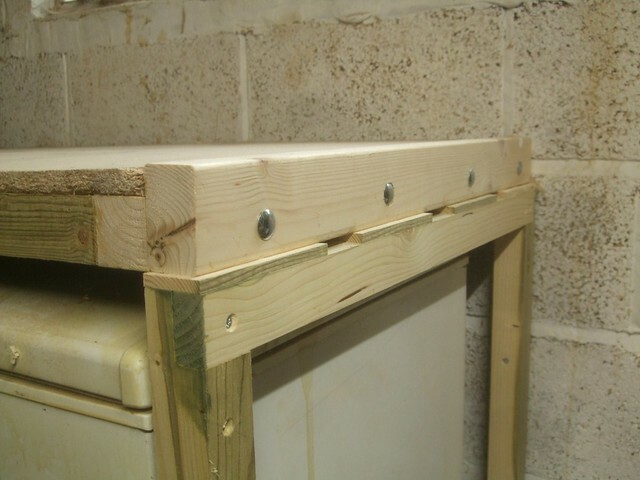 All I wanted were a pair of end-frames to support the top at each end, with a length of 4x2in fixed to the rear wall, to help carry more of the load. 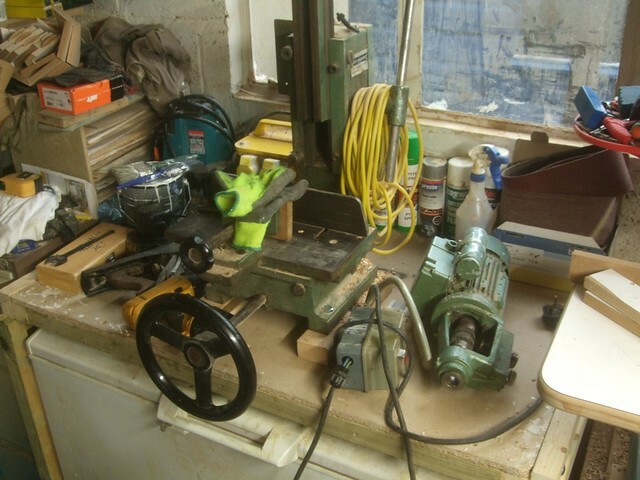 I chose simple lap-joints to assemble the end frames, as this meant I wouldn’t need to use my mortiser (which I had to disassemble before moving – it really is that heavy!!) or mess about with my router. 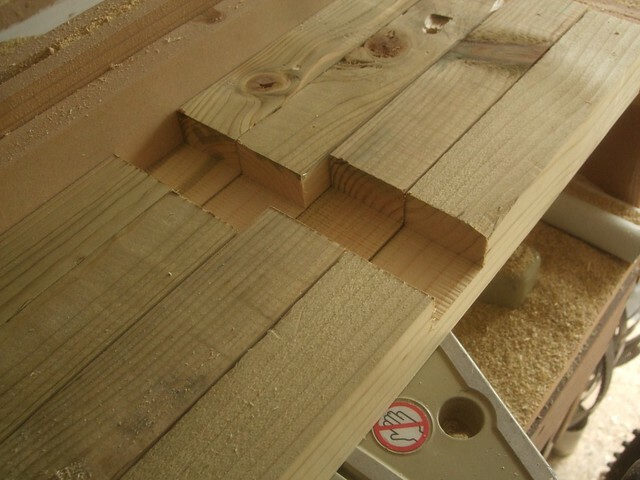 These were all cut on my mitre saw and then held in place with glue and screws, to save on using cramps. All the timber I used for this was left over or unused from the job I did fitting the suspended floor in to my workshop, earlier this year. Most of this 2x2in timber was going to be used to frame and insulate the inside of the roof but, I’ve never been able to stop that from leaking and, financially, other commitments have prevented me from doing that. There were some discrepancies in the finished dimensions though, meaning that I had to skim each face to ensure each length was indeed 44mm square, before cutting any of these joints. I didn’t have any confidence in the original sheet of 16mm thick chipboard. 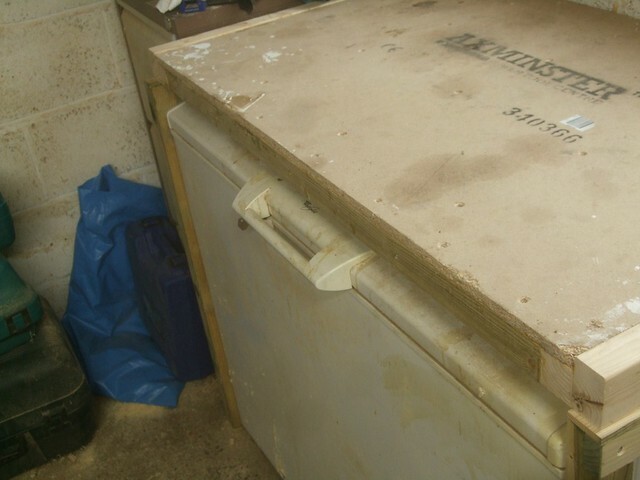 If that was left to carry the load of my mortiser across a span of over 1m then, well, I think that my previous lump of cast iron would only end up in pieces on the floor!! I’ve seen what can happen to this material when used incorrectly as a covering for shed roofs (the end result resembles asoggy Weetabix, very closely). With plenty of that 2x2in timber to hand, I decided to beef-up the underside of the top with timber framing. 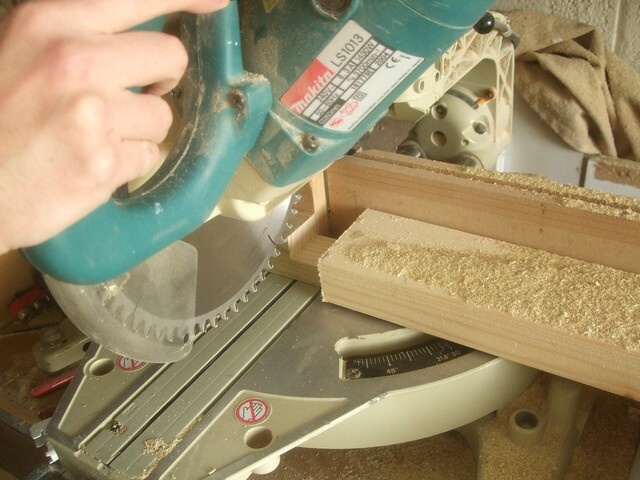 It’s very similar to a torsion-box construction except, I only have a skin on the top face. 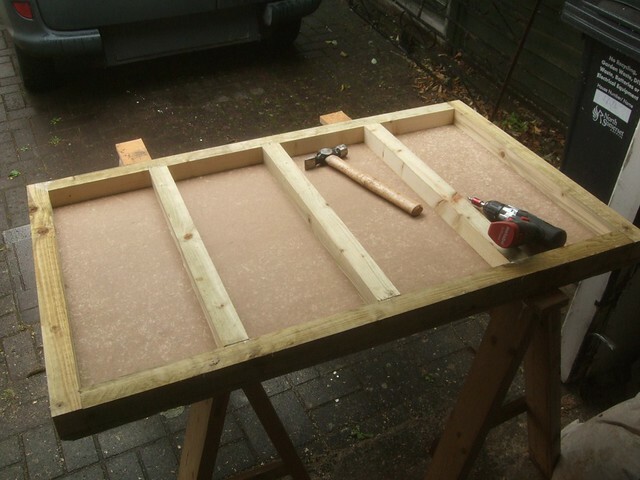 If I’d have had another sheet of chipboard that was large enough though, I’m sure I would have used it. I guess I could also have used lap joints again here but, as everything could be screwed together, I didn’t really see the point. 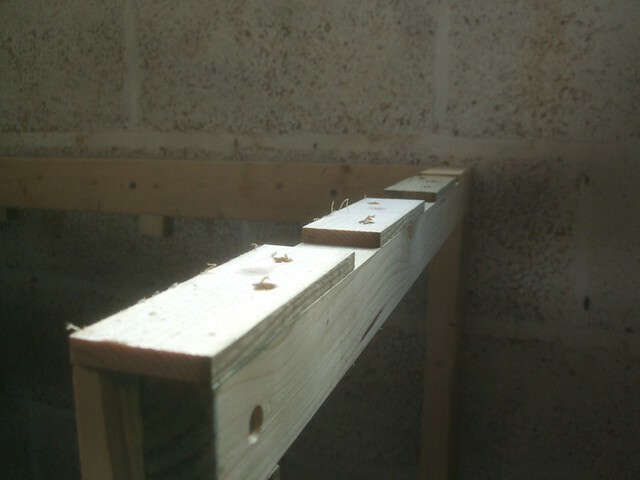 So, fixed to the wall, there were the two end frames and also, a length of 4x2in timber fixed between the pair of them. 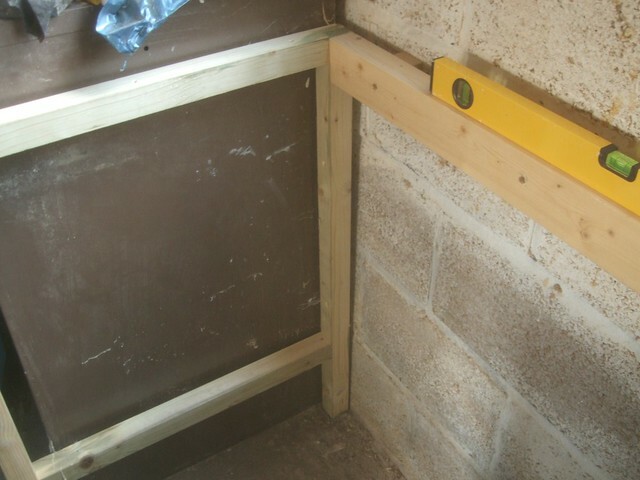 It was easy enough to get each of these level (horizontally) but, once again, I found that the rear wall of this workshop was sloping away, meaning that I had to insert a number of packers and spacers before fixing, just so that I could ensure everything was plumb along the vertical axis. With the 4x2in wall plate sat perfectly level and one end frame fixed to the left-hand end, I then discovered that the other frame was significantly lower, even though all four legs were batch cut to an identical length at the same time! In case you haven’t figured it out, the uneven concrete floor is also miles out! 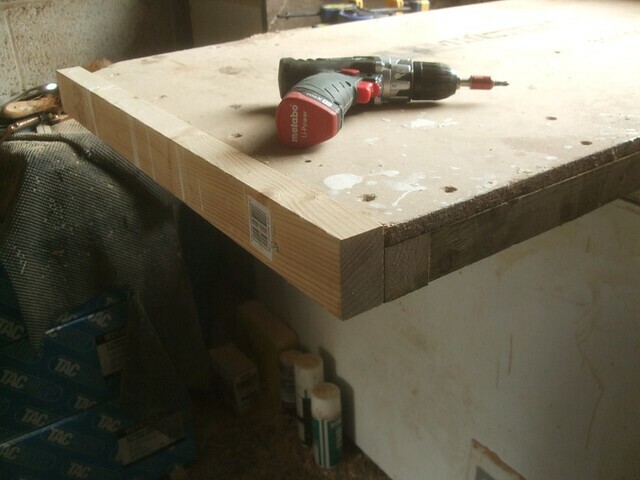 To overcome this, I fitted some thin offcuts (firring pieces) on top of the right-hand frame, which would help to keep the top level, once in place. It doesn’t quite conceal the front handle now but then, I guess that does make it more easily accessible. If I hadn’t had to pack out the frames so much to correct for the ‘leaning’ wall, the top would also have finished flush with the front of each leg. Nice idea – I need to try and make something simular for mine. 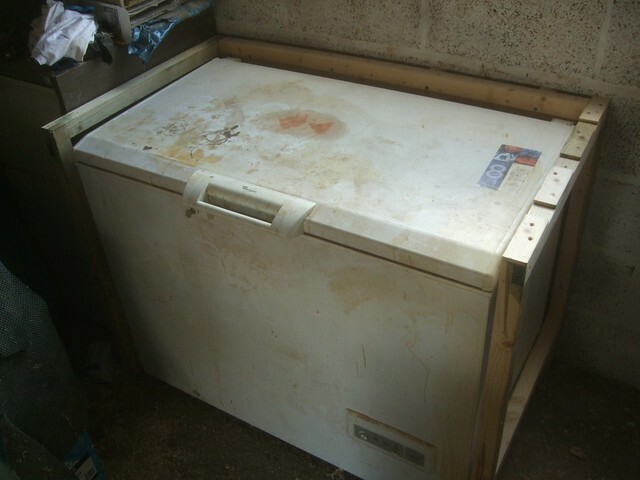 Be careful when you use your freezer next though as the top on mine has a habbit of condensating around anything you put on the lid.